Suggested Use: 1 to 3 capsule daily in divided doses, or as directed by a health care professional. NAC is one of the most studied of all supplements. Interest in it began during the 1960s when it was found to be useful to people with cystic fibrosis and other pulmonary ailments. In the 1990s medical researchers took a strong interest in it as an anti-HIV treatment, and it has been in the spotlight ever since. N-acetylcysteine (NAC) is converted in the body to the amino acid L-cysteine — a building block for the production of countless proteins needed by the body. 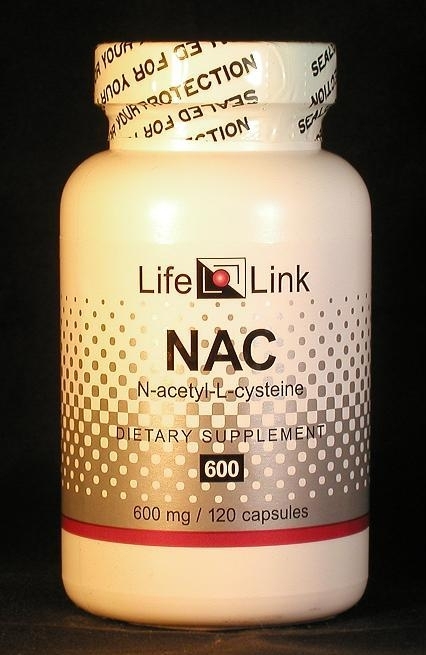 While NAC supplementation undoubtedly provides the body with all the benefits that derive from L-cysteine, the principal reason it is used as a supplement is to increase the body’s production of glutathione — a very important antioxidant that protects cells from being damaged or killed by certain metabolic byproducts. NAC is an inexpensive supplement that is safe and easy to obtain — so it would be foolish not to take advantage of it. While NAC supplementation undoubtedly provides the body with all the benefits that derive from L-cysteine, the principal reason it is used as a supplement is to raise glutathione levels. Accordingly, we will limit our discussion of N-acetylcysteine to a brief summary of relevant research, and let you draw your own conclusions about what medical conditions it may be effective in treating. NAC is one of the most studied of all supplements. Interest in it began during the 1960s when it was found to be useful as a ‘mucolytic’ agent — i.e., it lowers the viscosity of mucus in the respiratory tract, assisting people with cystic fibrosis and other pulmonary ailments.6 In the early 1990s medical researchers took a strong interest in it as an anti-HIV treatment,7 and it has been in the spotlight ever since. The list of medical applications of NAC is a very long one, as can be seen from the outline that follows. These are far too many applications to discuss in detail, so let us just look at one of them, as an example of the medical power of this supplement: the prevention of vascular damage caused by dietary AGEs — chemicals created in food by cooking. Whenever food is cooked, some of the sugars in the food are converted into substances called ‘AGEs’ (Advanced Glycation Endproducts).79 These are inflammatory chemicals that, when consumed, cause damage to the walls of arteries and veins, as well as accelerated aging in other tissues in the body. The body actually produces its own AGEs, but usually in smaller amounts than are found in the diet. Diabetics, however, often have higher levels of sugar in their blood, and so AGEs are produced in larger amounts in these people. The total AGE burden is therefore much higher in diabetics. In an important 2004 paper, researchers at Mount Sinai School of Medicine showed that diabetics experience substantially less damage to arteries when their consumption of AGEs is reduced.21 The research also showed that NAC interferes with a key process through which AGEs produce inflammation and tissue damage. Interestingly, this research project was motivated by the idea that atherosclerosis can be prevented by reducing dietary AGEs, not the idea that NAC can be used to counteract the effects of high AGE consumption. Yet NAC did, in fact, prevent AGEs from damaging vascular cells. This is just one example of NAC’s far-ranging effects on harmful processes taking place in the body. NAC is an inexpensive supplement that is safe and easy to obtain — so it would be foolish not to take advantage of it. Are N-acetylcysteine supplements useful for the conditions and purposes mentioned above? We aren’t allowed to tell you, so you should take a look at some of the references cited here, and then decide for yourself. Blesa S, Cortijo J, Mata M, Serrano A, Closa D, Santangelo F, Estrela JM, Suchankova J, Morcillo EJ Oral N-acetylcysteine attenuates the rat pulmonary inflammatory response to antigen. Management of paracetamol overdose: current controversies. Drug Saf. 2001; 24(7):503-12 Kozer E, Koren G.